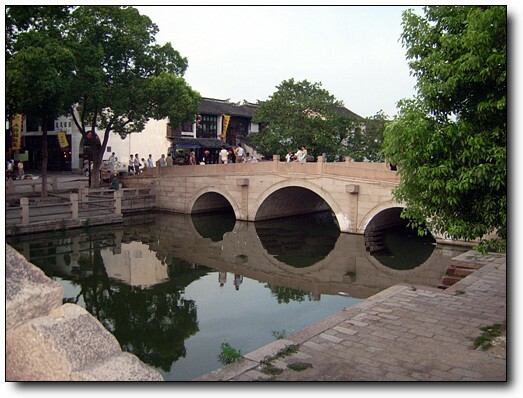 Location: No.23, Yuanlin Road, 3 km from Train Station & North Bus Station, northeast of Suzhou City, Jiangsu Province. How to get to Lion Grove: take buses No.2, 3, 5, 40, 55, 313, 301, 529, 923 or tourist buses No.1, 2, 5 and get off at the stop of Shi Zi Lin (狮子林, Lion Grove). 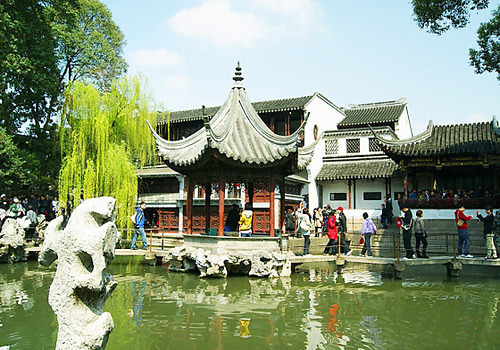 As one of the Four Best Known Classical Gardens in Suzhou, the Lion Grove is a typical southern garden of Yuan Dynasty (1271-1368). Originally a back garden of a Buddhist temple built in 1342, the latest renovation was made from 1917 to 1926. 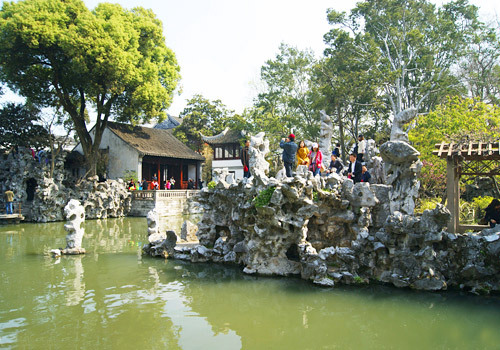 As a representative of Suzhou classical garden, Lion Grove is equipped with pavilions, terraces, halls, galleries and corridors; furthermore, it is a garden characterized by rocks and rockeries, and eulogized as the Kingdom of Rockeries. It has been inscribed into World Heritage List. Have undergone ups and downs, and segregated as an independent garden or residence from the temple for several times, the landscape gardening of Lion Grove is intentionally mixed with that of Buddhist theories, the family ancestral hall and western elements, all of which make it a temple garden with both rational Chan and recreational function of gardens. Covering 1.1 hectare, standing on a rectangle land, Lion Grove of Suzhou is a grand maze with scattered rockeries, encircled corridors, distinctive pavilions and twisted paths. Pool centered in the central part, rocks and rockeries are mainly found in southeast, and waters in northwest. With a compact layout, rocks, pavilions, plants and bridges are built one after another, painting a picture with rich contents. On the walls of corridors are inscribed calligraphies of the Four Greatest Calligraphers of Song Dynasty (960-1279), Su Dungpo, Mi Fu, Huang Tingchien, and Cai Xiang, as well as the painting of Wen Tianxiang, a national hero and patriotic poet of Northern Song Dynasty (1127-1279). 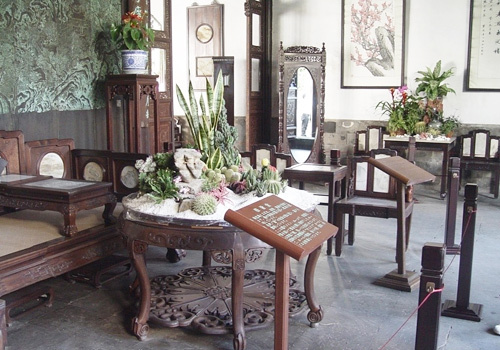 It is said that the Lion Grove was formerly built as a backyard garden for a temple, which was founded for an eminent Chan master Tianru by his disciples in 1342 in Yuan Dynasty (1271-1368), and named Shizilin Temple (Lion Grove Temple) because of numerous lion-like rocks and bamboo grove. After the completion, a great painter visited the garden and created a Picture of Lion Grove, which had brought great reputation to the temple and the garden that a great many poets and painters were self invited to the garden to meditate the Chan and create huge amounts of works collected in Lion Grove Collection. Nevertheless, the temple gradually fell into disuse after the pass away of Tianru Master. In Qing Dynasty (1644-1911), Emperors of Kangxi and Qianlong had visited the garden for several times and both granted inscriptions which still can be appreciated today. In 1771, a scholar who won the Number One in the final imperial exam had the garden fine repair and rename as She Garden (涉园), and the garden was separated from the temple as a private one. In 1917, the garden was bought by a wealthy pigment trader Bei Runsheng, who did a great expansion and renovation to the garden for 9 years, and renamed it Lion Grove again. After Bei Runsheng’s death in1945, the garden was taken over by his grandson and offsprings, who denoted the garden to the country later after the founding of People’s Republic of China in 1949. After another renovation by the government, Lion Grove was opened to the public in 1954. Architectures in Lion Grove can be divided into three parts, the ancestral hall, residential houses, and gardens. 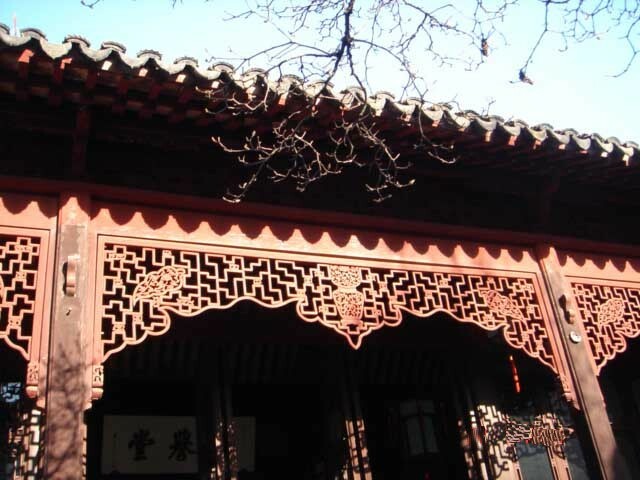 After entering the garden, it is the ancestral hall of Bei family with high eaves, deep halls, and quite a few elegant inscribed boards. Residential houses are representative by Yanyu Hall (燕誉堂), which is the main hall of the whole garden, significant and spacious with dignified and graceful furnishings. In the north on the auxiliary axis, there are four minor halls with beautiful spring sceneries offered by planted yulan and peony, as well as two flowering cherries. Outside the window in the east and west directions are planted wintersweet, nandina and rocks, which add classical graceful taste to the garden. Windows in Lion Grove are designed in diverse shape with delicate patterns; there are top grade flowers and plants, and the Four Arts of Chinese Scholar (qin, chess, calligraphy and painting) in Nine Lions Peak (a peak with nine lion-like rocks in various shapes). The door shapes are also distinctive, of which the begonia-shape door in Nine Lion Peak garden is the typical. In this Nine Lion Peak garden, there are two semi-opened pavilion standing opposite in the east and west with the Nine Lion Peak in the middle. Along its way in the north is another courtyard with a winding corridor leading the way to the main garden of Lion Grove. In main garden, the Lotus Hall and Zhenqu Pavilion (True Delight Pavilion) are built close to the water and are decorated with fine wooden carvings. A concrete structure stone boat is small and exquisite aside the pavilions. Another Pavilion with two storeys has its upstairs passageway ingeniously designed which is accessible to the rockery. Another corridor in the garden runs through several pavilions is surrounded by flowers, bamboos and small waterfalls. A pavilion named Feipu Pavilion (Flying Waterfall pavilion), which offers a flying waterfall, is said to be seated on the highest point of Lion Grove. It is said that Suzhou gardens are the top in south regions of Yangtze River, while rockeries in Lion Grove tops all Suzhou gardens. 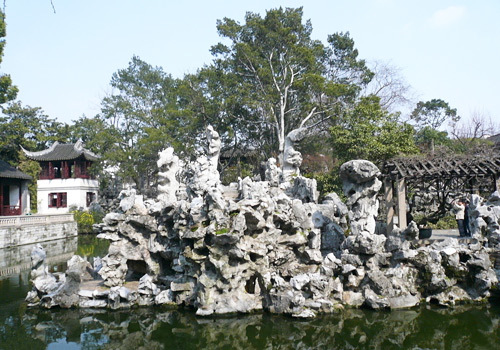 Rockeries in Lion Grove are the only surviving large-scale rockeries in Chinese classical gardens with crucial historical and art values. Peaks of rockeries are vigorously ups and downs; fantastic rocks are dainty and exquisite. There are totally nine tour lines and 21 caves to pass in the rockeries. To through the rockeries is to enter a zigzag maze. All rocks are the imitated shapes from human bodies, lions and beasts relevant to Buddhist stories with profound Buddhist theories. Rocks of Lion Grove are all top lake rocks not only in large quantity but also delicate and ingenious.